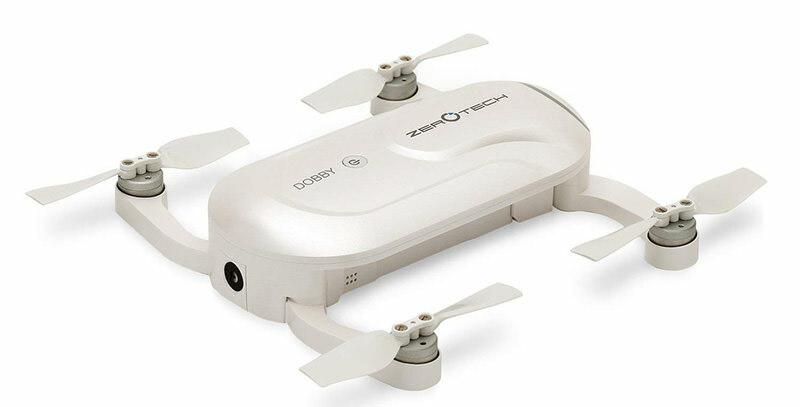 ZEROTECH Dobby offers buyers a moderately-priced drone option in a market that is quite saturated with big price tags. This micro-sized unit does not stand tall against the high-end drones that are currently available for purchase, nor was it necessarily meant to. The ZEROTECH Dobby is better considered as a toy, rather than a piece of serious photography equipment. However, for a toy, there is a lot to like. A very good camera. An easy to use interface. A pocket-sized build. The advertised “selfie drone” may appeal broadly to buyers that want a novel experience and are willing to tolerate a few frustrating setbacks. Size was a big emphasis on the design here. ZEROTECH wanted to create something that was lean and mean and, to this end, they were quite successful. This product is, in fact, small enough to fit in your pocket. Granted, not a small pocket. You won’t be able to conceal this gadget in your tight jeans. But if you have a generously sized coat or even a moderately sized handbag, you won’t have any trouble going out into the world with the Dobby. It measures at 6 x 3 x 3 inches and weighs in at just under a pound. It’s a quadcopter, which means that it has four tiny propellers, one on each corner. ZEROTECH also forgoes a controller and instead allows users to operate the drone via a phone app that is IOS and Android capable. The app itself is very simple. The display shows the view of the drone and provides simple controls that help you dictate where you would like it to move. On the front edge of the device, you will find the 1080p 14-megapixel camera. On top of the drone are vents for cooling, and a simple power button that accounts for the entirety of the onboard controls. On the bottom of the drone, you find sensors that stabilize the device as it flies. This control system is fairly common of drones in this price range and does make the drone a little bit easier to transport. Overall, the design concept does well to fulfill the promises of the concept. This drone has been made with the intention of being an entertaining accessory during a night out with friends. The lightweight concept and modest dimensions make for a drone that you should find easy to take around. Now that you understand the design concept, let’s look at how the drone actually performs. Below you will find features and aspects of the drone that highlight both what it does right, and what it does wrong. 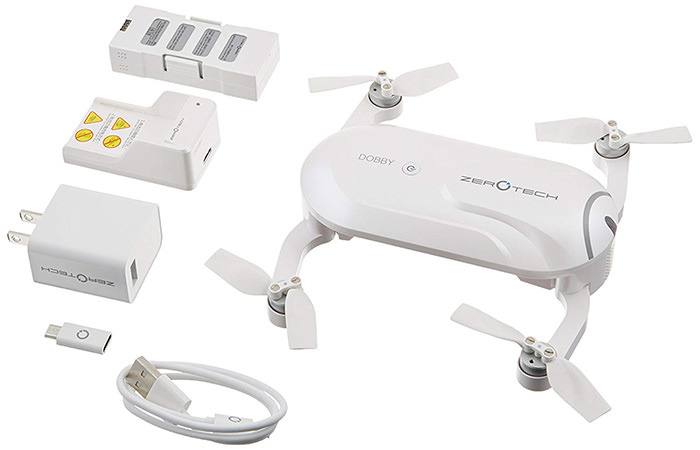 The battery life is one of the more disappointing aspects of this drone. Even the best options on the market usually only have a battery life of between 20-30 minutes. The Dobby falls considerably short of that figure. You should expect about nine minutes of flight time between each charge. For the price, this isn’t exactly unexpected, but it is still somewhat disappointing. Keep in mind also that the nine minutes refers to what you can expect in very mild conditions. Nine-minutes is a best-case scenario. Windy or otherwise troublesome conditions will further burden the battery and cause it to drain quicker. The ZEROTECH Dobby can fly to heights of 328 yards, which is actually fairly good considering the price. The nice thing is that even at max-range, the Dobby maintains impressive handling. The quality of flight control does not seem to diminish much with distance, which is a big point in the Dobby’s favor. If you do get out of range, the protocol is for the drone to land where you are. This is facilitated via GPS technology. For the most part, the feature does perform as intended, which is never a guarantee with drones. In general, the drone handles quite well. This is especially true when you factor in that the controls are very simple. However, you will want to account for the fact that the unit does not utilize side sensors that can prevent collisions with obstacles, like trees. If you want to keep the Dobby from hitting things (and we assume that you do) you will have to avoid doing so using your own skills as a pilot. Last, but of course, not least, we have the camera to think about. For a product that has been advertised for its ability to take a selfie, the camera is actually quite impressive. You get 14 megapixels here, and a video capacity of up to 30 frames per second. The onboard storage capacity for the images and video that you take is also quite impressive. You get 16 GB, which could be good for up to an hour of footage, or many hundreds of pictures. Looked at strictly as a drone, the ZEROTECH Dobby does leave something to be desired. Limited range and a disappointing battery life are all red flags when considering drones. However, a buyer that is familiar with the market might have anticipated these issues when they saw the price tag. Remember, this is the self-proclaimed “selfie drone.” It was never necessarily meant to revolutionize the market. And it doesn’t. What does it do? It promotes a fun experience. The 4K capable camera is still able to produce great photographs. The phone control mechanism is very convenient, and the size of the device makes it great for taking out on a fun night with friends. With managed expectations, there is plenty to find satisfying in the ZEROTECH Dobby.